The most important themes impacting global foreign exchange market right now are: Brexit and U.S.-China trade negotiations. The Australian dollar appears to be one of the most undervalued currency among 25 global currencies and the most undervalued one among the "seven majors". The British pound and New Zealand dollar look "overvalued". I see at least four trading opportunities based on the latest relative valuation analysis. Broadly speaking, I am bullish on AUD and bearish on GBP and NZD. As you know, once in a while, Splendid Exchange looks at seven major currency pairs in search of the evidence of popular delusions and the madness of crowds. The idea is to find anomalies and bullish or bearish divergences that will break the trend, not prolong it. It is a painful exercise, but also highly rewarding. Analyzed currency pairs: AUD/USD, EUR/USD, GPB/USD, NZD/USD, USD/CAD, USD/CHF and USD/JPY. Before revealing the results, let me first say a few words about the current global market environment. This is important, because global macro conditions cannot be numerically measured and cannot be directly factored into econometrical models. They must be studied in qualitative terms. In my opinion, the most important themes impacting global foreign exchange market right now are: Brexit and US-China trade negotiations. The recurrent theme in global macro news last week was "delay". A probable delay of the US-China summit concerns investors in that it could reflect a lack of a breakthrough on trade talks. In the UK, a delayed Brexit could lead to a softer Brexit but also to economic damage from prolonged uncertainty. The prospect of a possible trade war between the U.S. and China is still a real worry. Central banks' attempts to normalize monetary policy are now endangered by possible currency wars, which is just a logical fallout of any trade war. Forex traders should, therefore, be on high alert for competitive devaluations as countries across the globe take steps (either implicitly or explicitly) to depreciate the value of their currency to boost their economy. In this regard, it becomes particularly important to monitor currencies' relative value. This is exactly what my econometric studies attempt to achieve. Below are the latest results. I will not go through the results of each of the studies, but instead will illustrate the final ranking. If you want to see the individual results of each of the studies, scroll down to the charts section below. 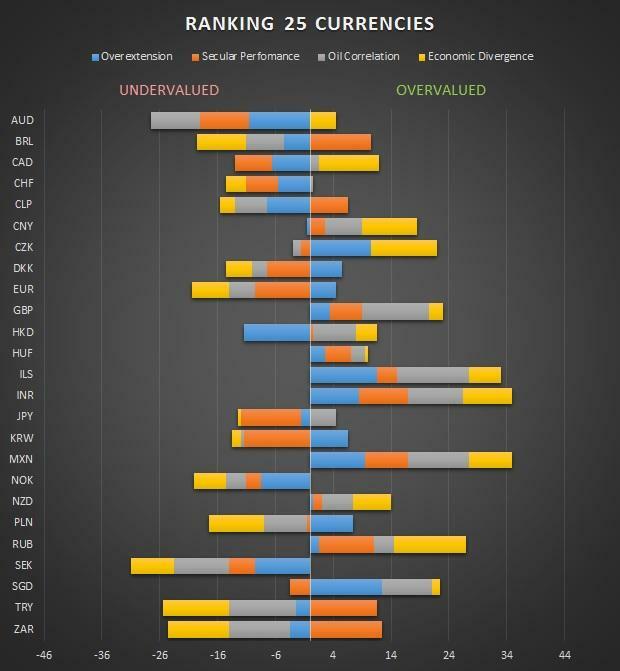 I have ranked the currencies on the scale of -11.5 to +12.5 for each of the studies, where -11.5 indicates oversold conditions and +12.5 indicates overbought conditions. Therefore, the overall minimum score that any currency can have is -46.0, while the maximum is +50.0. On balance, the Indian rupee and Mexican peso appear to be the most overrated currencies, with a total net score of +35 (see the chart above). However, the Israeli new shekel, Russian ruble and British pound are not far behind, at +33, +27 and +23 points, respectively. The most "underrated" or undervalued currencies are the Swedish krona (-31), Australian dollar (-23 points) and Norwegian krone (-20 points). When looking solely at the major currencies, we see that the British pound and New Zealand dollar stand out among the rest as the most overvalued currencies on the basis of all four studies. 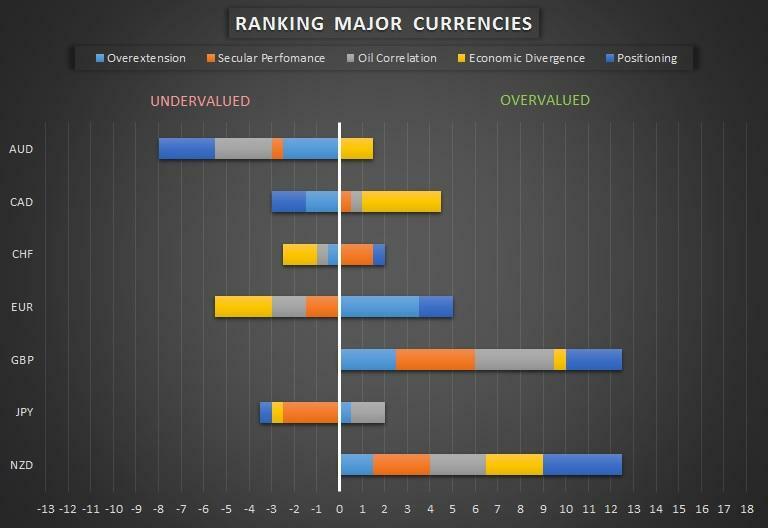 By turn, the Australian dollar appears to be the most undervalued currency among the majors (see the chart below). What is important is that the relative overvaluation of the British pound and New Zealand dollar is broad-based. In other words, the results are above zero for all four econometric studies + positioning analysis. At the same time, relative undervaluation of the Australian dollar is less extensive. For instance, economic divergence analysis contradicts the general results, indicating that the Aussie could be slightly overvalued. If you are a contrarian investor, you will want to short the most overvalued currency against the most undervalued currency. 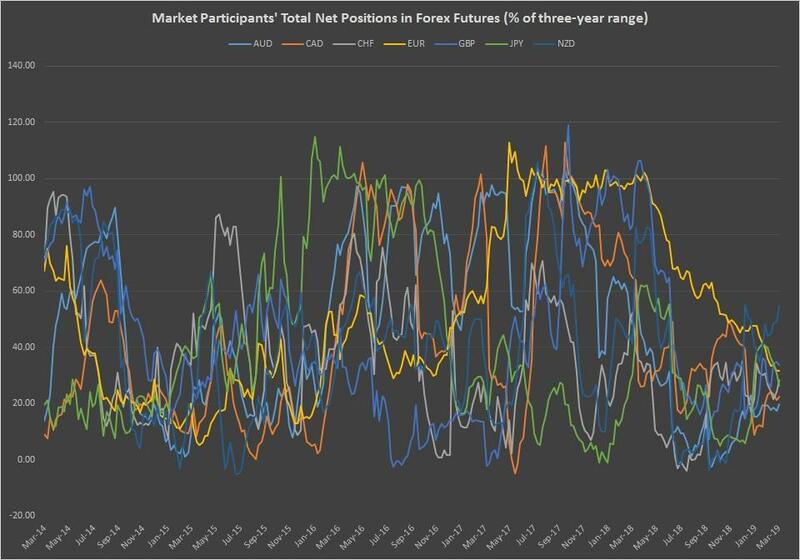 At this point in time, the most contrarian trade among the major currencies is to buy the Australian dollar against the British pound or against New Zealand dollar (or go long AUD/GBP or AUD/NZD). 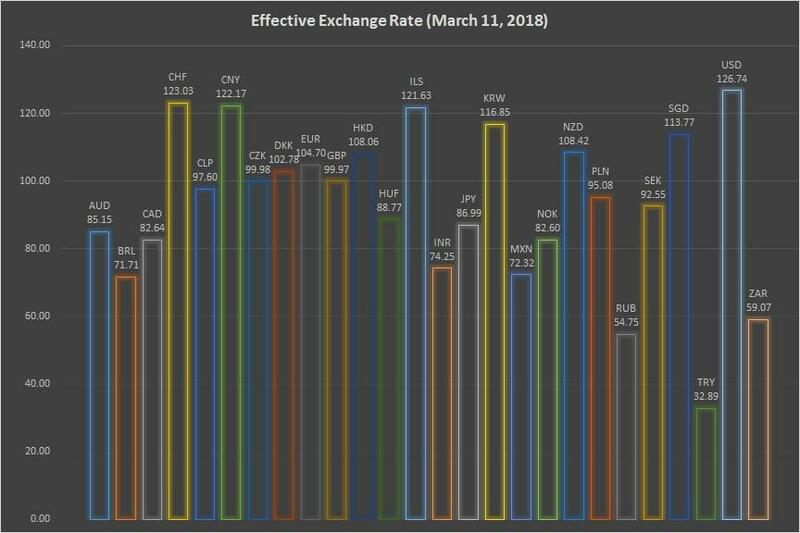 Now let's have a look at the effective exchange rate. 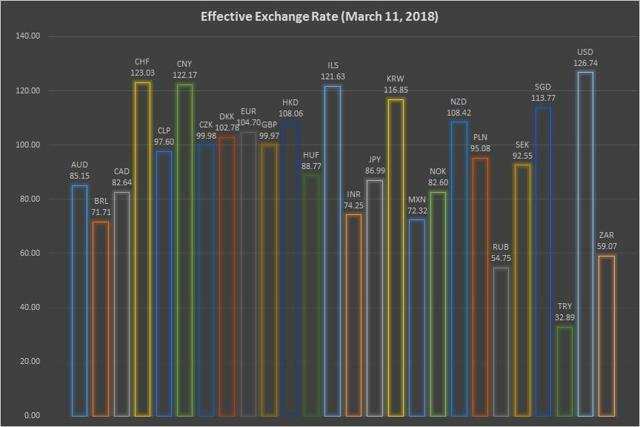 Effective exchange rate (EER) equals nominal exchange rate (calculated as geometric weighted averages of bilateral exchange rates) adjusted for relative consumer prices. The most recent weights are based on trade in the 2011-13 period, with 2010 as the indices' base year. 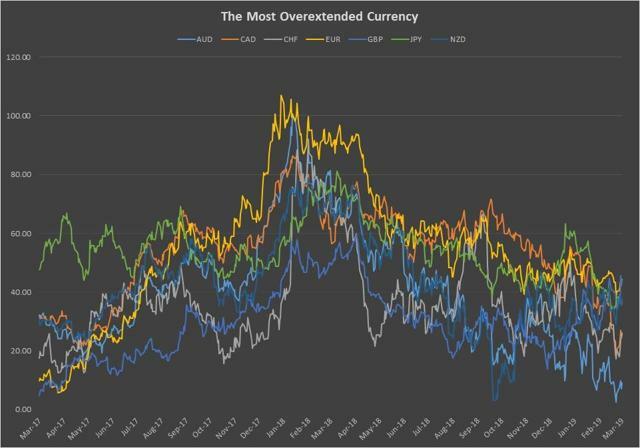 As you can see from the chart below, the U.S. dollar has appreciated the most among its peers, followed by the Swiss franc, while the Canadian dollar, the Japanese yen and Australian dollar are clearly lagging behind. Overall, the EER analysis does confirm the relative overvaluation of the New Zealand dollar (108.42), but does not confirm the relative overvaluation of the British pound and shows that sterling is "fairly valued" (99.97) - see the charts below. 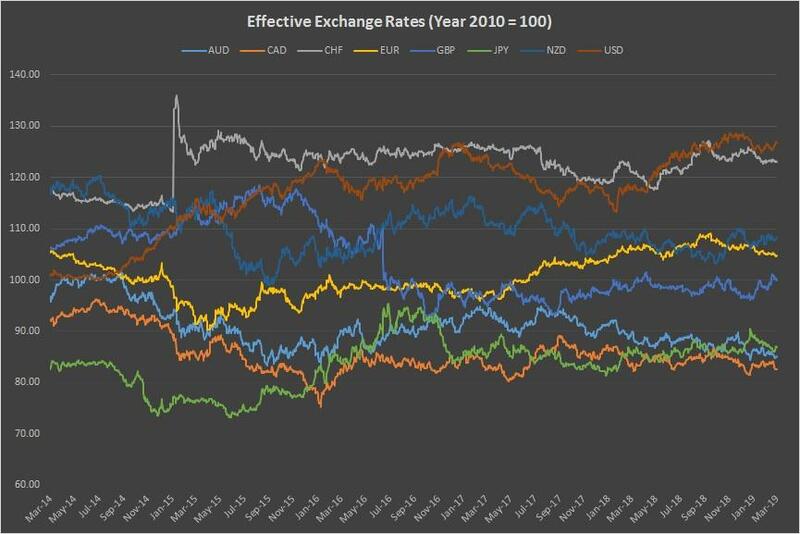 Over-extension analysis ranks the exchange rates in percentages of their respective trading ranges over the past years and allows us to see how far each currency has deviated from its historical (three-year) trading range. I choose to look at the three-year period for several reasons. First of all, it is long enough to capture more than half of a standard business cycle of most economies (according to the National Bureau of Economic Research, the average length of a business cycle is about 69 months, or a little less than six years). At the same time, a three-year range is short enough to be relevant and not to produce too smoothed-out results. In other words, analytical curves maintain some healthy volatility and tend to generate actionable trading signals. The most overextended currency is the euro. As of last Friday, it was trading at 44% of its three-year range. The most lagging currency is the Australian dollar, trading at only 9% of its three-year range. Assessing the strength of any given currency is quite tricky. Because we usually measure the performance of one currency against the other, the result is always biased. For example, a rising GBPUSD may not necessarily reflect improved fundamentals in the United Kingdom, but rather point to deteriorating fundamentals in the United States. A less biased approach would be to compare a currency's performance against some kind of neutral asset, such as gold. Analysts call it a secular performance analysis. Secular performance is a useful but underused concept in forex trading. It is important measure because gold (it is assumed) has some intrinsic value as opposed to fiat currency, which is just a "legal tender" not backed by physical commodity. In the end, the price of gold will be determined by supply and demand rather than by central banks' monetary policy and the printing press. Analyzing currency performance against the gold allows us to see the scale of "real" demand for this or that currency. 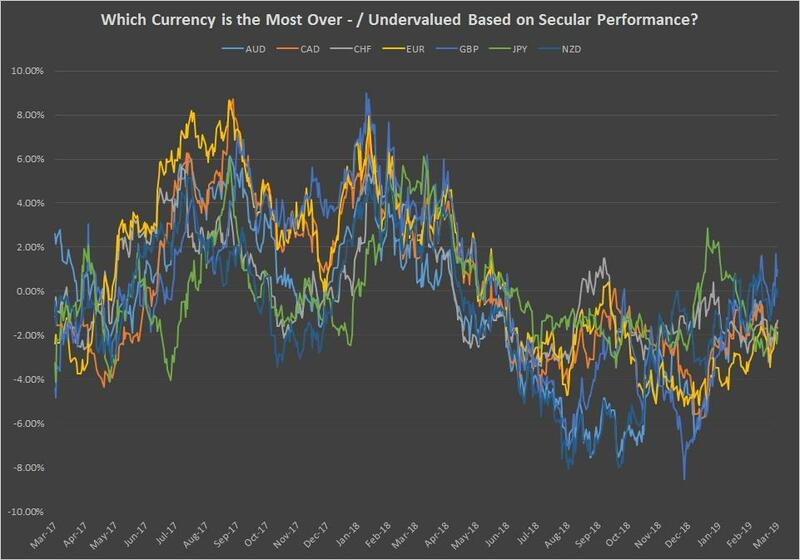 Based on the 12-month running secular performance observations, I have calculated that the US dollar is currently overvalued by an average of 1.1% against seven majors. However, as of last Friday, it was most overvalued against the Japanese yen (2.00%) and the euro (1.9%). In other words, USD/JPY is the most overvalued currency pair based on secular performance analysis. Oil correlation study simply examines the link between a country's exchange rate and the price of oil. This relationship is important because oil prices serve as an important proxy for future changes in consumer price index, which influences countries' macroeconomic policies, which, in turn, affect the exchange rate. 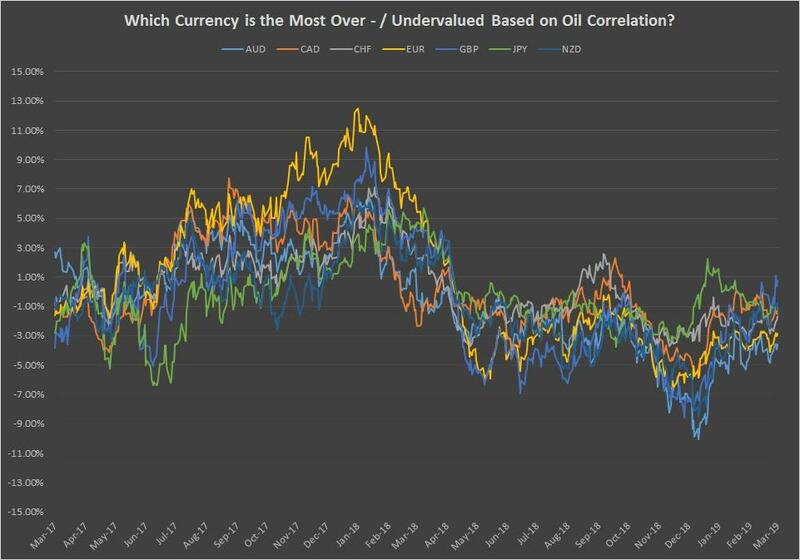 Based on the 12-month running oil price standard correlations, I have calculated that the Australian dollar is undervalued by only 3.60%, while the British pound is overvalued by around 0.70%. As a general rule, economic data should always justify the moves in currencies' exchange rates. However, it is difficult (if not downright useless) to cherry-pick a single economic indicator and compare it to a currency's performance, because the relative importance of any given economic indicator will vary depending on the economy in question. For example, trade balance data can influence the exchange rate of commodity exporters, such as Australia and New Zealand, but it is less relevant for the United States, whose dollar is a world's "safe haven" (at least for now). In theory, GDP growth should act as an ultimate barometer of economic health, but the data is released too infrequently (usually on a quarterly basis) to be relevant in my analysis. Instead, I prefer to look at countries' bond yields. Two-year bond yields are considered to be an important measuring stick for market confidence and investor appetites. Most importantly, yields essentially reflect investors' and traders' expectations of central banks' monetary policy, which is a major driver for the exchange rates. Therefore, the difference between two countries' two-year bond yields should indicate which country is running a more expansionary monetary policy (which should be bearish for that country's currency) and which country is in the contraction stage (which should be bullish for that country's currency). Usually, the currency of the country with the higher bond yield appreciates against the currency of the country with the lower bond yield. 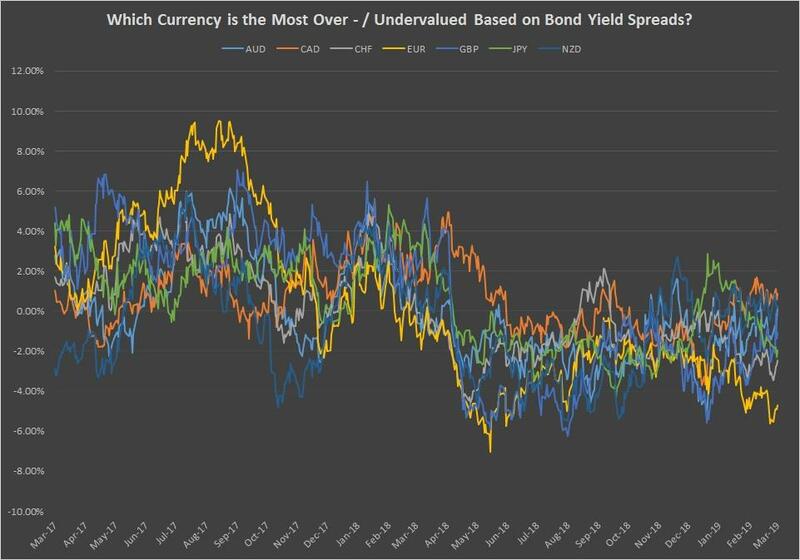 Based on the 12-month running two-year bond spreads correlations, I have calculated that Canadian dollar is the most overvalued currency among the majors (+0.90%), while the euro is the most undervalued (-4.7%). Commitments of Traders reports issued by the U.S. Commodity Futures Trading Commission help me analyze traders' sentiment. In all my studies, I am on the lookout for potential extremes over a three-year period. Specifically, I monitor net positions by non-commercial traders (large speculators, such as hedge funds) and convert them to the scale from 0 to 100. A reading close to 0 suggests that commitments are close to the lower bound of a three-year range, while a reading close to 100 suggests that commitments are approaching the upper bound. For me, overbought conditions are present when non-commercial positions are at 90 and higher, while oversold conditions are present when non-commercial positions are at 10 and lower. On this measure, the most overbought currency is the New Zealand dollar, while the most oversold currency is the Australian dollar. Long AUD/USD. Targets: 0.7120, 0.7200, 0.7300. Stop loss: 0.7050. Long AUD/GBP. Targets: 0.5400,0.5435, 0.5500, 0.5560; Stop loss: 0.5300. Long AUD/NZD. Targets: 1.0400, 1.4900, 1,0550. Stop loss: 1.0300. Short ILS/SEK. Targets: 2.370, 2.300, 2.210. Stop loss: 2.6070.